As a child, I collected countless objects: spoons, stamps, teddy bears. You name it, I had it. And today, these collections survive, only now they’re accompanied by clothes, shoes and various sorts of herbs and spices. Whilst it may seem slightly odd for me to admit this, I’ve always found that there is something extremely satisfying about assembling a large group of objects and sorting them one by one into different categories, orders and arrangements. I find that as I do this, eventually, the differences of each object seem to outweigh their similarities, and it becomes apparent that each detail of each object is important and each object has its own unique story and past. And I don’t think I’m alone in this love. The Victorian past time of collecting has infiltrated both the world of art, from Joseph Cornell’s secretively collected assemblages to Martin Creed’s carefully arranged cacti in Work No 960 – Cactus Plants, as well as our everyday life. 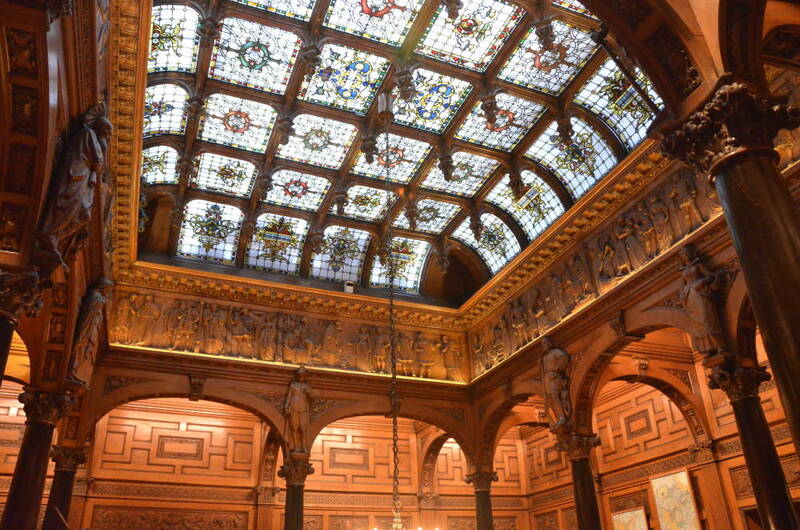 2 Temple Place is a beautiful neo-gothic mansion on the London Victoria Embankement, worth visiting just for its interior, and currently home to the Cotton to Gold exhibition. This exhibition brings together the collections of 11 philanthropic collectors from the North West of England during the Industrial Revolution. The former greatness of this historic period of time is present from the moment you enter the room: an impressive mechanized loom is placed directly ahead of you, serving as a stark contrast from the relatively small objects you find within the collection. A close up of part of the collection. The exhibition invites you to ‘get lost amongst the treasure and the taxidermy’ it beholds, and that’s exactly what I did.The collections on display are varied, unusual and beautiful – from Roman coins, to Turner water colours, to my favourite: a collection of medieval illuminated manuscripts, intricately and luxuriously decorated in gold leaf, depicting scenes of the Crucifixion – complete with tiny, baby-like souls leaving the bodies of the two thieves either side of Christ – as well as astrological and medical diagrams. 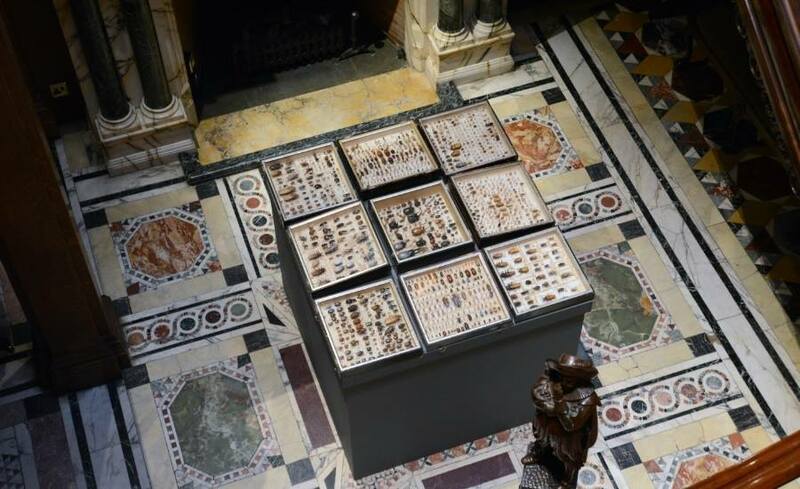 What’s more there was a collection of several hundred beetles, all meticulously labelled and arranged in wooden cases. This would probably be unnerving to some but for me was one of the most enthralling parts of the exhibition. The little tiny insects on display confirmed to me that an exhibition has the power to showcase both the psyche of the creator of the object on display (or in this case, the collector) and that of the viewers as well. Our responses to it will differ and what one person may dislike in an exhibition, another person may treasure. Such is the power of art, whatever form it takes. As corny as it sounds, I came away from the exhibition feeling uplifted and hopeful. It gave me a keen wish to start up my childhood habit of collecting again, to go rifling through boxes at antique fairs in search of the perfect sugar sifter. And more, it made me want to visit the smaller museums that lent these collections to the exhibition in the first place. Often overlooked and therefore lacking the necessary funding to survive, many of our country’s secret but great collections are in danger of ceasing to exist at all. The ‘Cotton to Gold’ exhibition made me feel resolutely that the next time I’m visiting somewhere new, I won’t disregard that small town museum as unworthy now that I live in the Centre of All Things Cultural that is London. It made me realise that I could miss out on some of the most peculiar, inspiring and unusual artefacts I’ll ever see. Find me in a museum near you. Georgina is currently studying History of Art. She is often found hipping and hopping amongst the coolest and raddest – being as cool and as gangster as her nickname ‘Gee’ would suggest. She has an obsessive personality and is often found listening to the same song over and over again – much to the annoyance of her flatmates. When she’s not being awesome, she enjoys eating peanut butter from the tub, drinking green tea and having a sing-a-long. I read this article and found it very interesting, thought it might be something for you. The article is called On a Treasure Hunt: Finding ‘New’ Collections and is located at http://prancingthroughlife.com/2015/03/24/on-a-treasure-hunt-finding-new-collections/.